in Social Media with tags bravo, GIFs, Giphy, NeNe Leakes, RealityTV GIFs, tumblr Both comments and trackbacks are closed. 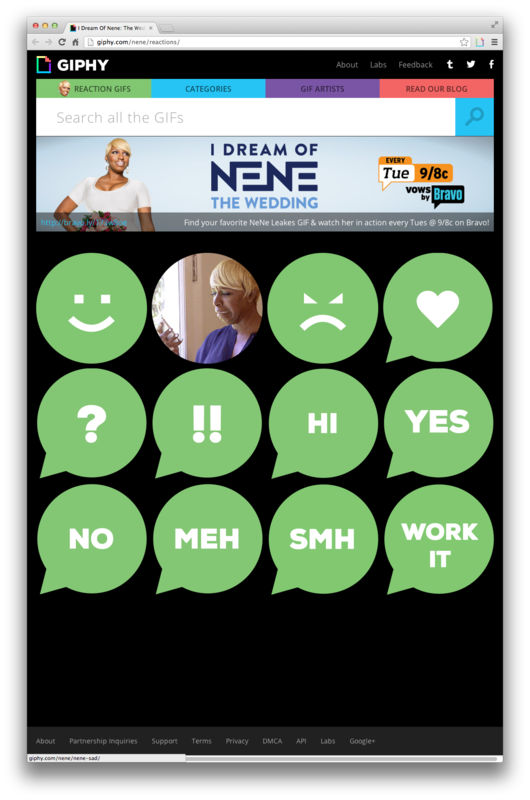 To support the new hit show I Dream of NeNe: The Wedding (airing every Tuesday @ 9/8c), BRAVO & 360i have teamed up with the GIF archive and search site Giphy to highlight one of the most GIF-able “Bravolebrities” around: NeNe Leakes. BRAVO is the first entertainment brand to partner with Giphy. The partnership is perfect for BRAVO and Leakes in particular, as her over-the-top personality and exaggerated demeanor is ripe for GIF content. In fact, for the past two days, NeNe has been trending on Giphy.com. Likewise, it was a natural fit for BRAVO to be the first brand partner to takeover Giphy’s reactions with a NeNe Leakes Reaction GIF page. But it doesn’t stop there. All season long, fans will be able to visit the BRAVO-branded I Dream of NeNe: The Wedding landing page that houses all the NeNe GIFs you could ever want. BRAVO & 360i also worked with the popular Tumblr blog RealityTV GIFS to create custom GIF content that features footage from the first episode of the show to drive buzz around I Dream of NeNe: The Wedding in its early weeks. The ultimate goal? Give avid BRAVO fans more ways to find and share their favorite moments, and hopefully to <3 them as much as NeNe herself, too.